In this article, we will install Oracle VM VirtualBox 6.0.6, which allows you to install and run virtual machines on Windows 10 PC / Laptop. Oracle VM VirtualBox can be run easily on many systems. In this article, we will install VirtualBox on Windows 10. Before installing Oracle VM VirtualBox on Windows 10, for more information about this software check out the What is VirtualBox Virtualization. VBox is a virtualization program as you know, and with this program, you can build many new virtual operating systems on your my physical computer. After installing Oracle VM VirtualBox on Microsoft Windows 10 operating system 64-bit/32-bit, you only need to obtain the ISO files of Windows, Linux, and macOS operating systems. Setting up VBox on Windows operating systems is very easy. 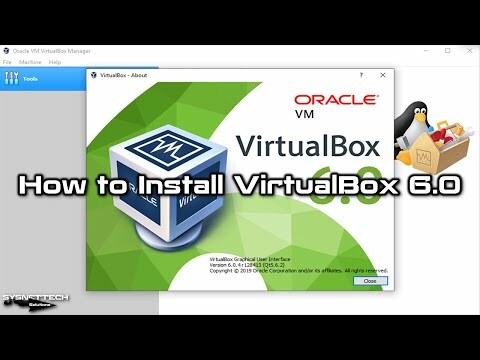 There is no setup difference between the continuously developed versions of VBox and as a result, after downloading each new version to your computer, you can follow the steps below to install VirtualBox and Extension Pack. We can now move on to the steps of installing VirtualBox. VBox program also requires an Extension Pack to use hardware resources more efficiently. After the setup of VBox, we will also build the Extension Pack. The user interface is made simpler and more stable. Support to export virtual machines to Oracle Cloud infrastructure. Support for 3D graphics for Windows Guests. Support for Hyper-V performance on Windows 10. You can check out Changelog for more information about the VirtualBox 6.0.6 innovations. We recommend using VirtualBox 6.0.6 to create a new virtual machine on Windows 10 and install a Linux operating system on it. To install VirtualBox 6.0.6 on Windows 10, follow the steps below. To download Oracle VM VirtualBox 6.0.6 for Windows 10 first, visit https://www.virtualbox.org/wiki/Downloads and click Download VirtualBox 6.0 as in the image below. If the operating system type you are using is Windows 10, click on Windows Hosts to start the download. After downloading the setup file to your computer, click on the file with the .exe extension as Right Key / Administrator. After the setup wizard opens, click Next. In the Custom Setup window, leave it as default as you see in the image below and click Next. To create a desktop shortcut and quick launch shortcut for Oracle software, tick the options in the bottom image and click Next. It is reported that your network settings will be disconnected for a short period of time. Click Yes to continue the installation of the program. Click Install to start the VirtualBox 6.0.6 installation on Windows 10. After the installation process is complete, select the option below to run the program and click Finish. After you run the VirtualBox 6.0.6 virtual machine program, you can check the version from Help / About as follows. Once you have successfully installed Oracle virtualization software on your system, the first thing you need to do is add the Extension Pack. You can transfer files between virtual machines and your host by using drag and drop. You can also use the running VMs in full-screen mode. Follow the steps below to install Extension Pack 6.0.6. To download Extension Pack 6.0 for Windows 10, click on All supported platforms as in the image below. You can see that the Extension Pack software you downloaded to your computer is green. Double click on the file to start the setup, then click Install as in the image below. After installation of the extension package completed, click OK and close the information window. After adding the Extension Pack for VBox on Windows 10, click File / Preferences and then Extensions to check the version. You can see the Extension Pack version in the program interface as in the image below. To set up VirtualBox 6.0.6 and Extension Pack 6.0.6 on Windows 10 PC/Laptop, you can watch the video below and also subscribe to our YouTube channel to support us! First, you need to download Oracle VM software to your computer. Visit virtualbox.org/wiki/Downloads and download it by clicking on the Windows hosts for Windows platform option. Right click on the Setup file and then click Run as administrator. Continue by clicking the Next button in the Setup Wizard window. All features will be installed by default in the program properties installation window. Leave these options as they are and click on the Next button. In the shortcuts window, you can continue by simply selecting the option if you want to leave a shortcut on the desktop. The Network Interfaces window informs you that the network feature will reset your network. Continue by asking Yes if you want to continue with the installation. Oracle VM VBox is ready to install! Click the Install button to start the installation. To use USB devices on your computer, you need to install additional software such as the following. If you encounter a screen like the one below, continue by clicking the Install button. The process to install Oracle VM VBox on Win 10 has been successfully completed. You can start the program by clicking the Finish button. After completing the steps to install Oracle VM VBox on Windows 10 64 Bit, we need to add the Extension Pack to make hardware devices such as USB more capable and more efficient. You can still download the Extension Pack from your its site. In Step 1 above, download the Extension Pack from All Supported Platforms. After you download the Oracle VM Extension Pack software to your computer, it will be a green color as shown in the following image. Double-click on the Extension Pack to begin installation or right-click / open. In the Extension Pack installation, you will encounter a question like the one below. Click on the Install button to continue installation. Continue accepting the agreement at the License window. The installation of the Extension Pack has complete. Click OK to continue. After setting up VirtualBox in Microsoft Win10, you can see from the image below that it is the latest version of the program. In this article, we have implemented the steps to install VirtualBox. In our next tutorial, we will setup the operating systems using VirtualBox. Thanks for following us!